Dolma is the most famous dish, which needs grape leaves. Leaves should be chosen young, with delicate veins. While using in food they should be harvested young, before they become coarse, to have maximum elastic lamina with still juicy veins. 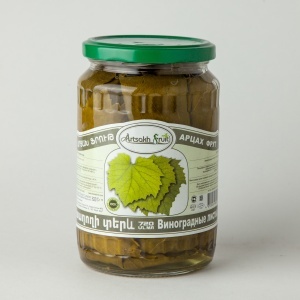 Ingredients: Grape Leaves, salt, water. Solomon’s seal is a perennial plant, whose healing properties have been known since ancient times. 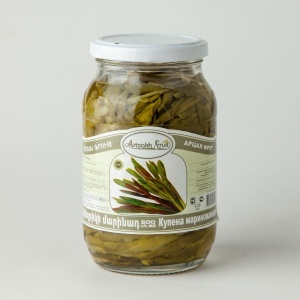 In its composition are cardiac glycosides, alkaloids, saponins and mucous substances. Solomon’s seal is an excellent analgesic, antipyretic, hemostatic, anti-inflammatory, blood-cleansing, expectorant, emetic and enveloping means. 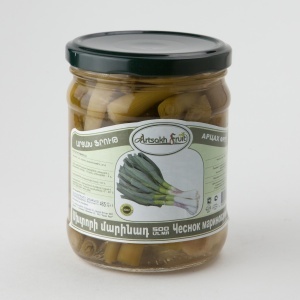 Solomon’s seal – a favorite snack of many Armenians, has a specific bitter-sweet taste. Ingredients: Solomon’s seal, acetic acid, salt, water. Crunchy pickled cucumbers – ‘must-have’ snack at your table. 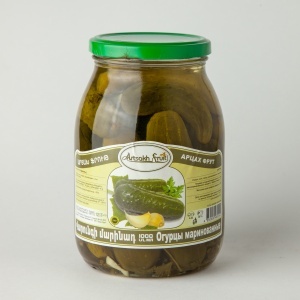 Ingredients: Cucumbers, salt, sugar, acetic acid, spices. Since ancient times, the beneficial properties of fennel attracted the attention of people. In ancient mythology, this plant symbolizes success and victory. Today, the healing properties of fennel is recognized by traditional and alternative medicine. 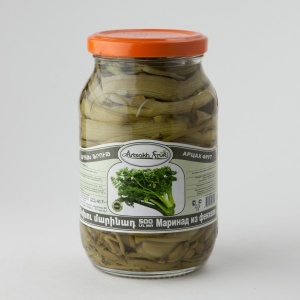 The fennel contains many useful elements, such as potassium, calcium, iron, magnesium and others. Fennel is able to restore the appetite after illness, as well as contributing to the overall improvement of digestion. Ingredients: Fennel, salt, sugar, acetic acid, water. 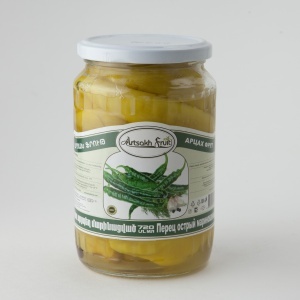 Mucus from okra formed due to the large amount of water, is useful for gastro-intestinal and respiratory tracts. Dishes with okra are recommended for people with severe physical work, and those who need to recover from surgery operation. Okra is a product that has no contraindications, except individual intolerance. 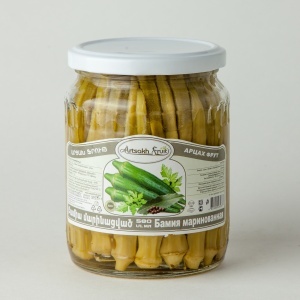 Ingredients: Okra, salt, sugar, acetic acid, water, spices. Substances contained in hot peppers are able to stimulate appetite, cheer you up and normalize the blood circulation of the brain. Regular consumption of hot pepper stimulates endofrina, which is called “the hormone of happiness”. Ingredients: Hot peppers, salt, sugar, acetic acid, water, spices. Chillies – a close relative of chervil, carrots and parsnips. It has a delicate complex flavor, a pleasant sweet taste. Used as savory snacks. It has a pleasant -sweet-sour taste. The butene contains ascorbic acid, carbohydrates, essential oils and other biologically active agents. Ingredients: Chillies, salt, sugar, acetic acid. The beneficial properties of garlic are innumerable. In traditional medicine, it is used for the prevention and treatment of many diseases. Pickled garlic copes with virus and colds. Often the product is recommended as a means to help reduce bad cholesterol, and is assigned to the treatment and prevention of heart disease. Ingredients: Garlic, salt, sugar, acetic acid, water.